Kenya's High Court on Friday 22 February 2019 postponed the judgement on whether to scrap colonial-era laws which criminalise homosexuality, citing a heavy caseload. "The files are above my height... we are still working," said Chacha Mwita, one of the judges, who added that one of his colleagues was on leave and other members of the three-judge bench were overwhelmed with multiple cases. The ruling has been postponed to May 24. 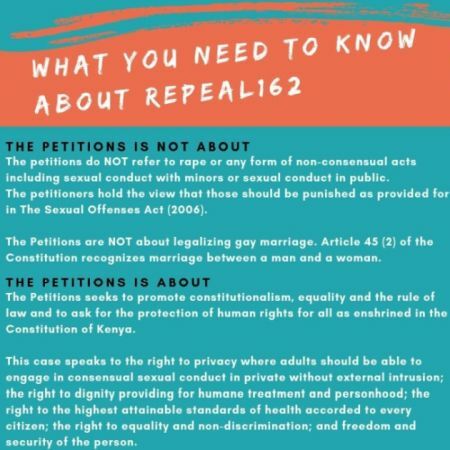 In 2016, the National Gay and Lesbian Human Rights Commission (NGLHRC), the Gay and Lesbian Coalition of Kenya (GALCK), and the Nyanza, Rift Valley and Western Kenya Network (NYARWEK) together with partners filed Constitutional Petitions 150 of 2016 & 234 of 2016, at the Kenya High Court. These petitions challenge the constitutionality of sections 162 a) and c) and 165 of the Penal Code of Kenya. The Petitions ask the court to declare these provisions unconstitutional and in violation of rights guaranteed to all Kenyans in Chapter Four – Bill of Rights of the Constitution of Kenya. These rights include: “the right to privacy, dignity, health, equality and non-discrimination and freedom and security of the person” as enshrined in our Constitution. The Petitioners also argue that sections 162 (a), (c) and 165 of the Penal Code continue to validate stigma, discrimination and violence towards individuals who do not conform to society’s expectations on gender identity, gender expression or sexual orientation.